With a few entries remaining (whose email addresses are on the desk of what I often refer to as my day job), we have finished festival notification of all of our entries for this season, both those that were selected, and those that were not. Invariably, there are hurt feelings and disappointed filmmakers, and (being a sensitive person myself) I take this process very seriously. Which is why I want to recommend a brand new publication by my friend Chris Holland of B-Side Entertainment called Film Festival Secrets. 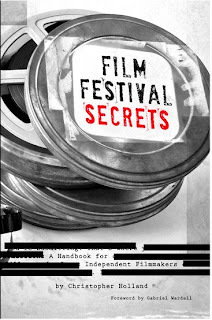 The book also has a blog, but the book itself -- regardless of format -- is a must-read for any aspiring filmmaker, as well as anyone involved in the Film Festival Circuit. Our lineup wasn't easy to come by -- our meetings were full of fisticuffs, as usual -- but we are proud of what we believe to be a strong set of films. We hope to have our schedule up on B-Side early in the new year.